Went out to check the mail today and we were surprised with quite a little present. That my friends is the Tampa Bay Rays’ very own BJ Upton along with his brother Justin Upton of the D-Backs. 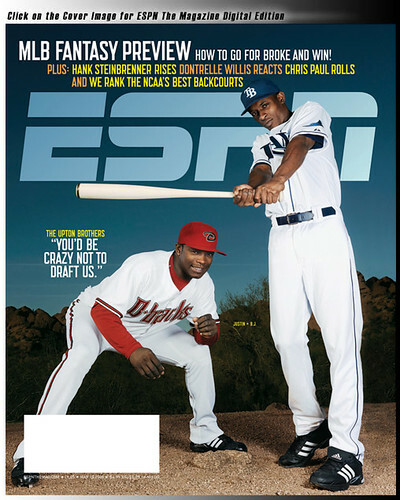 And no, this is not a fake magazine mock-up from one of those booths at the Trop. A major sports magazine actually put a Ray on the cover. We don’t recall this ever happening before. Can anybody think of an example? And how about that uni on BJ? We were tentative supporters of the new uni’s since the beginning, but now we are really getting excited. We understand the green was unique and set the Rays apart…but boy, BJ sure looks more like a baseball player now. We likey. HOLY SH!T! When did ESPN figure out the Rays actually exist? too bad it is a fantasy baseball article. now if we can just get them to actually write about the Rays. You can make a fake cover @ http://www.FotoTrix.com (photo tricks).